The Detonics Combat Master was the first really small and compact 1911-pattern pistol to be produced in significant numbers. Law enforcement fell in love with it immediately due to its diminutive size and quality. It received “star quality” when Don Johnson as Sonny Crockett in Miami Vice was seen carrying one in a leg holster in the show. Far more important than the media exposure was the revolutionary reliability work done inside the pistol. 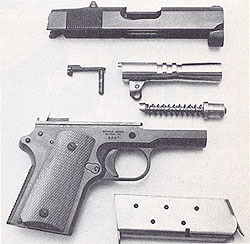 The Detonics introduced the bulged barrel end so that the pistol did not require a bushing. It also incorporated double and triple recoil springs. It was the first production 1911-pattern which was throated and ramped for hollowpoints. The high price and limited market for the pistol doomed the company, but were the Combat Master to be reintroduced today, it would no doubt be a different story. 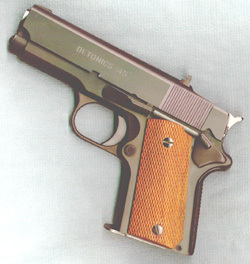 Those fortunate enough to own a Detonics pistol treasure them. “I said, ‘Well, you guys aren’t doing very much. What are you looking for? What are you trying to do? I really didn’t think it would work out, but promised to give it 100 per cent. They agreed, and in July of 1989 New Detonics was in business in Phoenix. Detonics’ line of guns expanded from the Combat Master to include the Commander-sized Servicemaster, Government-sized Scoremaster, and the compensated, race-gun style Compmaster. I don’t really know how or why the company finally failed. All of the reviews of Detonics guns, as late as 1991 were positively glowing. They were VERY expensive. The Combat Master cost $400 when a Colt Commander cost $250. The top-of-the-line Compmaster target pistol, similar to the various custom “pin guns”, was over $1600 in 1991! Extractor, firing pin and spring, magazine catch/spring/lock, slide stop/safety plunger assembly, plunger tube, trigger, mainspring housing, mainspring cap, mainspring housing pin retainer, mainspring cap pin, mainspring housing pin, stock screw/bushing, safety lock, hammer pin, sear pin, slide stop, barrel link/pin, disconnector, sear, hammer, hammer strut pin. Frame, slide, barrel, rear sight, firing pin stop, “grip plate” (grip safety), sear spring, magazine, stock panels, recoil spring guide, recoil spring cap (plug), recoil springs (two or three, depending on model). recoil springs – single, Wolff; dual, King’s Gun Works (Officers ACP recoil spring set). stock panels – Gun Parts Corp.; “slim-line” grips, Brownells.